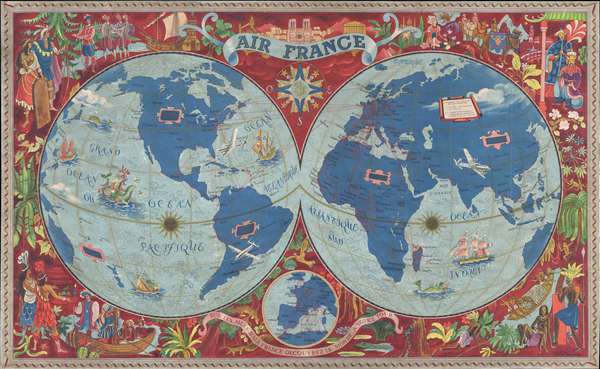 One of Boucher's most remarkable mid-century modern promotional maps for Air France. Air France -- Sur les Ailes d'Air France Decouvrez le Monde a Votre Tour. One of Lucien Boucher's more iconic images, this is his 1952 promotional map of the world for Air France in the large format edition. The map depicts the entire world in rich blues and burgundies with gold highlighting. Air France routes are highlighted in red. The surround, on a field of burgundy, features illustrations of global historic events, flora, fauna, and cultures, all in a mid-century modern ethic. Printed by Perceval of Paris in 1952. Good. Light spotting throughout – use zoom. Margins trimmed to neat line. Priced accordingly.